For more than 90 years, we have developed custom molded glass solutions for customers in a wide range of industries. Our unique molding process allows us to create a variety of complex shapes and unique forms that are often difficult and expensive to achieve through machining or fabrication. We specialize in custom, small lot glass manufacturing and have the flexibility to adjust glass melt volumes and meet aggressive lead times. 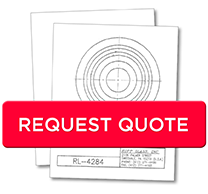 Our fully integrated research team, engineering facility, photometric lab, and mold shop enable us to assist you from the design phase of your project through mold construction, manufacturing, and finishing. Our technical services include Design for Six Sigma consulting so that your product design team can be sure that custom glass solutions are engineered to be produced as efficiently and flawlessly as possible.